The early part of Karen’s life was taken up with many fun sports, skiing , cross country skiing then snowboarder back in the beginning of the sport. Also mountain biking, hiking, just about anything outdoors. 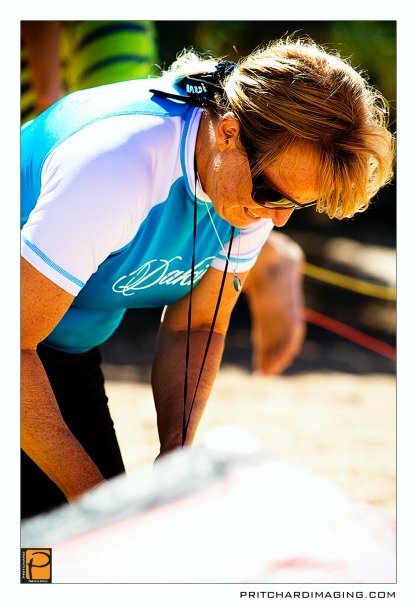 She started windsurfing in 1980 in Lake Tahoe, The Gorge and Rio Vista, then came to Maui to windsurf and surf in 1990 and never went back home. Spent many fun days sailing and surfing her favorite spot, Ho’okipa. 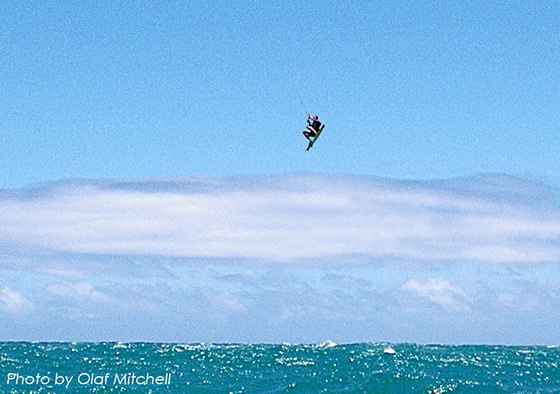 Later a friend gave her a kiteboarding lesson and she was hooked! Working with the legendary windsurf sail designer Barry Spanier, Karen was responsible for making the prototype sails for the company as well as the personal quivers of the top sailors of the time, 13 time world Champion Bjorn Dunkerbeck, Laird Hamiton, Josh Stone, Jason Polakow, Jason Prior and many more. When Cabrinha joined NP, got to work with Pete Cabrinha building kites. 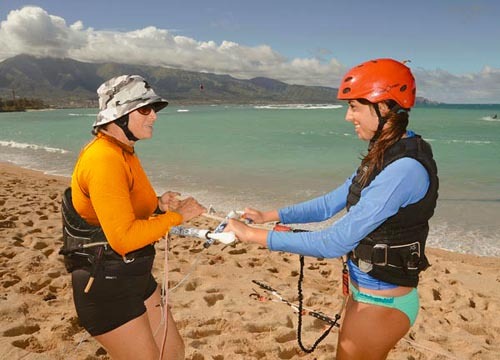 Karen’s love of kiteboarding led her to take the Course to teach kiteboarding, she says:”I love teaching kiteboarding! This is such a fun sport , the students are really stoked and it’s very gratifying”. Karen started Northshore Kite and Sail Repair over 15 years ago. She has a great niche business here on Maui. “I get to meet almost every kiter sooner or later, either I give them lessons and teach them how not to crash their kite or if they don’t take lessons I get to fix the kites they break while they are trying to learn”! 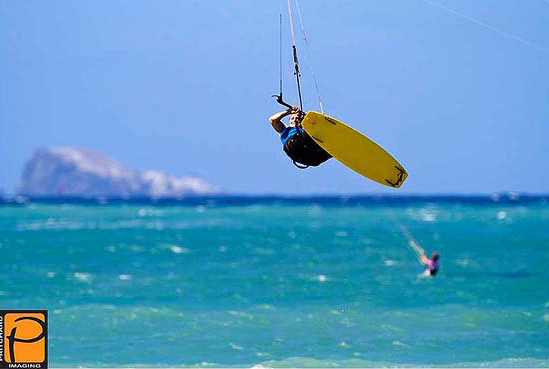 Kathy K, Cardiff by the Sea, CA “Karen is an amazing kitesurfing instructor. Not only is she super friendly, but her easy-going nature and her knowledge of this sport really helped calm the butterflies in my stomach while doing this sport. She gave me tips and techniques that allowed me to master flying the kite, instead of the kite flying me. Thank you, Karen,for giving me the stoke of learning this sport”! Jessica A : Karen was thorough, encouraging and positive. She made sure I was proficient and confident in my basic survival skills before anything else. She was clear in communication and made me fell confident while encouraging me to challenge myself. I will recommend her to all my friends who wish to get into kiting! Shaun S : Karen took the time to teach me safety first and self rescue. Some great tips to do things properly and to break some of my bad habits! Amanda C : Very attentive, lots of great tips that fined tuned my efforts, friendly and encouraging, highly recommended! Isabelle T : Great teaching skills, a pleasure learning with you and keep learning this great sport! Marius T : I had lots of fun because Karen has great teaching skills and always has a smile to cheer you up! Jaap N: The best instructor ever!